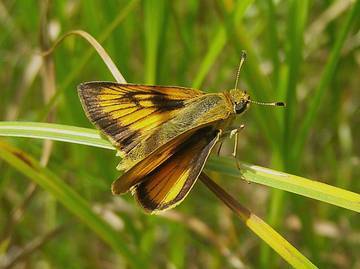 This bright, active and conspicuous skipper was described by W. H. Edwards. He first called it Hesperia logan, but then on the next page of the same article called it Hesperia delaware, probably referring to the Delaware, or Lenni Lenape, Indians, who lived in the Philadelphia area where the species was found. The first name has been given nomenclatural priority, but the second is the source of our common name for the butterfly. Delaware Skipper has been moving its range northward since about 1900 (Stichter 2013b). In New York in the 1970’s Shapiro (1974) reported it as a coastal plain and Hudson River valley species, rare in upland central New York, and mentioned that it was “perhaps moving northward.” In Maine, historic records prior to 1974 are very few and limited to extreme southern Maine, whereas the recent Maine Butterfly Atlas is finding Delaware in many townships in mid-Maine (MBS 2010). In New Jersey this species has gone from “rare” at the turn of the century to “widespread and occasionally common” in the 1990’s (Gochfeld and Burger 1997). Delaware Skipper has similarly expanded its numbers and range in Massachusetts. Sometime between 1889 and the 1930’s, Delaware Skipper arrived in eastern Massachusetts. Like several other immigrant species, it is likely to have arrived separately in the eastern part of the state, rather than moving east from the Connecticut River valley. By 1934 Farquhar (1934) is able to list several eastern towns where it had been collected: Weston (C. J. Paine); Stoneham “not rare” (C. V. Blackburn); Newtonville (A. H. Clark); and Marblehead (F. H. Walker). By 1934 it had also been found in more towns in western Massachusetts: Ware (F. E. Zeissig, D. W. Farquhar), Phillipston (H. H. Shepard), and Sunderland (F. H. Sprague). It was not, however, found on Nantucket or Martha's Vineyard in the 1930's and 1940's (Jones and Kimball 1943), and in fact has not been found there today. By the 1970’s, Delaware had become “common” in several areas in eastern Massachusetts. In 1971 E. Peters reported to the Lepidopterists’ Society that A. delaware was “common” in Carlisle; he collected a male and a female in 1971, and a female in 1970. In 1973 W. D. Winter found the species “common this year” in Westwood, Dover and West Medway; he had also found it in Westwood in 1972 and Millis in 1974 (specimens in the Harvard MCZ). In 1974, D. Willis reported that Delaware was “uncommon” in July in the Holliston-Sherborn area (Lep. Soc. Seas. Sum. and Corresp. 1970-1981). In western Massachusetts, R. Wendell Sr. collected a specimen in Pittsfield on 7/12/1982. Overall, Delaware Skippers probably increased in Massachusetts between 1900 and 2000 (Table 2). Delaware Skipper is a widespread and successful species in eastern North America, though not usually abundant at any one site. It is at the northern limit of its range in the three northern New England states, occurring only in mid- Maine (MBC 2010), mid-New Hampshire (BAMONA 2010), and western and southern Vermont, where it is common (VBS 2010). It is found south to mid-Florida, and west to the plains states, from Texas north to southern Canada. Delaware Skipper’s wide range is probably due to its use of several different host grasses, and a variety of habitats. The main listed hosts are big bluestem (Andropogon gerardi), switchgrass (Panicum virgatum), and wooly beard grass (Erianthus divaricatus) (Scott 1986), but which species are used in our area remains to be discovered. Erianthus normally occurs further south rather than in New England (Magee and Ahles 1999), so the other two are the most likely here. These grasses occur on both wet and dry soil. Delaware Skipper may also use little bluestem (Schizachyrium scoparius) in the wild (NatureServe 2009); the Connecticut Atlas raised it on this in the lab. Some authors have speculated that Carex may also be a host grass, since Delaware is often found in wet meadows. More research is obviously needed on this skipper’s ecology. Moist areas appear to be the preferred habitat, but Delawares are active fliers and also make use of dry areas. Wet meadows, and pond and marsh edges, both fresh and brackish, are good habitats, but Delaware Skippers can also turn up in gardens, parks, and drier grasslands, nectaring on a wide variety of flowers, including milkweeds, mints and thistles. Knowledge of host plant use would clarify which habitats are most critical for larval development. Delaware Skipper is no longer rare in Massachusetts, as it was at the turn of the century, but simply uncommon. The 1986-90 Atlas found it “Uncommon to Common” in the state overall, but MBC records 2000-2007 rank it at the upper end of the “Uncommon” scale, about on a par with Dusted Skipper and Broad-winged Skipper (Table 5). Chart 99 shows an overall downward trend in sightings, which is not easily explained. The year 2004 is an outlier, owing to an unusual report of 240 on 7/11/2004 on the Northern Worcester NABA Count; in all other years that Count has tallied 50 or fewer, and the number of participants and party-hours was not significantly different in 2004. However, whether that number is omitted or included, the downward trend remains apparent. A list-length analysis of these data by G. Breed et al. (2012) also found a 51.9% decline in Delaware Skipper 1992-2010. MBC and other records 1992-2013 show Delaware Skipper reported from 128 out of a possible 351 towns in the state (Map 99). It is well-distributed across the entire state except for Martha's Vineyard and Nantucket. On the mainland, Delaware Skipper could probably be found almost everywhere in the state in suitable habitat. The white areas on Map 99 are mostly towns from which there were no observers reporting. Delaware Skipper continues to be either absent or rare on Martha’s Vineyard and Nantucket. There are no MBC, Atlas or other historical records for those two islands (e.g. LoPresti 2011). MBC has one somewhat uncertain sight report from Chilmark on the Vineyard, 6/24/1995. However, the Vineyard checklist calls it “rare, with no recent reports” (Pelikan 2002), and it has never been reported from the Martha’s Vineyard NABA Counts. The largest numbers of Delaware Skipper are usually reported from the central part of the state, with smaller and less regular reports from Cape Cod and the Berkshires. On the NABA July Counts 1992-2013, the Blackstone Valley, Concord and Central Franklin Counts have reported Delaware Skipper nearly every year since their Count’s inception, in high double-digits. The Northampton, Northern Worcester, and the three Berkshire Counts have reported them most years in varying numbers, some in double-digits. Reports from the Cape Cod and Bristol NABA Counts have been uncertain and variable, but on a few occasions Delaware Skippers have been found in numbers, as for example 19 on the Falmouth Count on 7/23/2009, and 15 on the Brewster Count that year. The Truro and Barnstable Counts also sometimes report Delaware Skipper. Mello and Hansen (2004) report it "well-distributed" across the Cape. The Atlas had found Delaware Skipper “apparently absent from most of Cape Cod and the islands, at least until recently.” It is now obviously not absent, but numbers seem more variable from year to year compared to other regions of the state. Ashburnham power line, 2 on 7/14/2013, C. Kamp; Athol Cass Meadows, 9 on 7/13/1999 D. Small; Boston 4 reports; max 3 on 7/15/1996 B. Malcolm; Burlington Mary Cummings Park, 6 on 6/25/2010 S. Stichter; Canton Great Blue Hill, 3 on 7/16/2007 F. Model; Carver Myles Standish SF,10 on 6/27/2010 M. Arey; Concord, 52 on NABA Count 7/11/2009 D. Walton et al. ; Falmouth Crane WMA, 32 on 7/14/1997 A. Robb; Grafton Dauphinais Park, 5 on 7/6/2007 W. Miller and E. Barry; Greenfield, 9 on 7/6/2013, T. Gagnon et al. ; Harvard Stow Road CA, 6 on 7/4/2004 T. Murray; Hopedale Draper Park Old Dump, 7 on 7/16/2000 T. and C. Dodd; Lexington Dunback Meadows, 8 on 7/19/2003 T. Whelan; et al. ; New Marlborough, 8 on 7/8/2011 B. Benner; Newbury Martin Burns WMA, 8 on 7/5/2013 S. and J. Stichter; North Andover Weir Hill, 4 on 7/12/2001 F. Goodwin; Northbridge Aldrich Rec. Area, 16 on 7/2/2012, B. Bowker and L. Stillwell; Orange, 5 on 7/9/1995 D. Small; Rockport, 11 on 7/25/2004 D. Savich et al. ; Sheffield Bartholomews Cobble, 3 on 7/8/2012, B. Benner et al. ; Shrewsbury power line, 5 on 7/15/2003 B. Walker; Sudbury Great Meadows NWR, 7 on 7/11/2009 S. Stichter; Sutton Lasell Rd., 11 on 7/6/2013, E. Barry, D. Price; Topsfield Ipswich River WS, 4 on 7/10/2005 F. Goodwin et al. ; Truro/Providence, 10 on 7/7/2012, T. Hansen and A. Robb; Uxbridge West Hill Dam, 5 on 7/14/2012 T. and C. Dodd; Wales Norcross WS, 17 on 7/14/2011 E. Barry et al. ; Ware, 4 on 7/18/2010 B. Klassanos; Wellfleet Wellfleet Bay WS, 6 on 7/27/2009 M. Faherty; West Boylston Gate 28, 6 on 7/20/2003 B. Walker; Williamstown Mountain Meadow Res., 2 on 7/14/2012, B. Zaremba and P. Weatherbee; Windsor Notchview Res., 3 on 7/12/2012, T. Gagnon et al. ; Woburn Horn Pond Mtn., 4 on 7/4/2007 E. Nielsen et al; Worcester Broad Meadow Brook WS, 5 on 7/18/2004, B., R. and M. Walker. Delaware Skipper has been reported to have only one brood in Massachusetts, but September sightings in nine out of 23 years 1992-2013 tell us that this skipper is now undoubtedly having a partial second brood in good years. Delaware Skipper's flight period is mainly from June through mid-August, peaking the second week in July (http://www.naba.org/chapters/nabambc/flight-dates-chart.asp), according to 1993-2008 MBC records. Earliest sightings: In the 23 years of BOM-MBC records 1991-2013, the six earliest "first sightings" are 5/30/2011 Northampton Florence, T. Gagnon; 5/30/2003 Northampton Florence, T. Gagnon; 5/31/1998 Northampton Florence, T. Gagnon; 6/1/2000 Williamstown Mountain Meadow Preserve, P. Weatherbee (and 2 other 6/1 reports); 6/1/2002 Milford power line B. Bowker; and 6/2/1999 Chelmsford C. Dodd. The 1986-90 Atlas early date had been 6/21/1988, Topsfield, N. Beck. In six of the 23 years 1991-2013, the first Delaware Skipper reports have been on or before the first week of June (6/7). In an additional 10 years, the earliest report has been before the end of June (June 30). In the final seven years, the first sighting was in the first week of July. It seems likely that in the years when the first sighting was not until July observers were simply missing the first fliers. Delaware Skipper is thinly distributed and its locations are a bit unpredictable, so it is not usually the target of specific searches. A century ago Scudder wrote (1889:1616) “it seems to appear upon the wing early in July, occasionally by the very last of June, and to fly until the middle of August.” It seems there has been some advance in the timing of the spring flight since Scudder wrote. Latest sightings: In the same 23 years of records, the seven latest "last sightings" are 10/4/2004 Sudbury community gardens, T. Murray; 9/28/1994 Deerfield, D. Potter; 9/24/2006 Northampton community gardens, T. Gagnon; 9/23/2010 Sherborn power line, Bob Bowker; 9/23/1998 Northampton community gardens, D. Case; 9/19/2013 Raynham Borden Colony, J. Dwelly; and 9/16/2012, Concord Nine-Acre Corner, G. Kessler and B. DeGraaf. There appears to be some lengthening of the tail of the flight period in the last century, since Scudder wrote that the flight ended in "the middle of August." In the early 1990's Glassberg (1993) reported that in the southern New Jersey salt marshes there were two broods of Delaware Skipper, mid-June and August. It should not be surprising if this skipper is now having a partial second brood in Massachusetts in some years. NatureServe (2013) lists Delaware Skipper as S1S3 or “imperilled” in Maine, but ”apparently secure” (S4) in Massachusetts and S5 in other nearby states such as Connecticut and New York. There is no obvious reason to think that this adaptable, southerly skipper would be negatively impacted by climate warming in New England. It might even increase in numbers. (For species affected by climate change, see Table 6).